All students can understand that water can absorb heat and increase in temperature until it boils away. Many students do not realize that steam can also be heated and has much more thermal energy that boiling water. To illustrate this, a piece of paper is held at the end of the copper tube and will only be scorched when a bunsen burner is used to heat the steam. 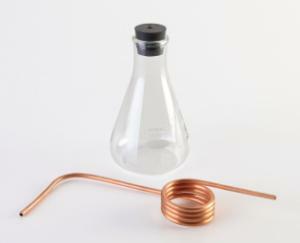 Comes complete with copper coil tubing, one-hole, #6, rubber stopper, 250 mL Erlenmeyer flask and detailed instructions. Required but not included are a hot plate, bunsen burner, thermometer clamp and support stand.